DALLAS BILLINGTON was born in a log house in western Kentucky. Although his parents were devout Christians, he did not respond to the gospel until, at the age of twenty-one, he attended a tent meeting in Paducah, Kentucky at the invitation of his fiancé, Nell Stokes. After moving to Akron, Ohio to gain employment and during a serious illness of his infant son. He answered God’s call in 1927 to preach. In June, 1934, he was invited to pastor a group which was meeting in Rimer School. There, with a congregation of thirteen and an offering of $1.18, the Akron Baptist Temple was born. Under his ministry during the next thirty-eight years, the church grew to sixteen thousand members and physical assets of several million dollars. Its radio and television programs and its missionary outreach made its ministry worldwide, and it also has helped establish hundreds of independent Baptist churches across America. Dr. Billington’s messages were plain, simple, to the point, and masterfully illustrated. He always preached with the invitation in view and was used of God to win thousands of men to Christ. His compassion for people, his integrity, his spotless example as a man of God will long be remembered. Having had heart trouble since 1941, he died August 26, 1972, at age sixty-nine. 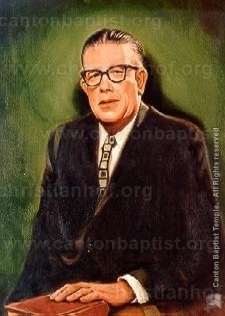 His only son, Charles, who had served with him for twenty-four years, succeeded him as pastor of the Akron Baptist Temple.